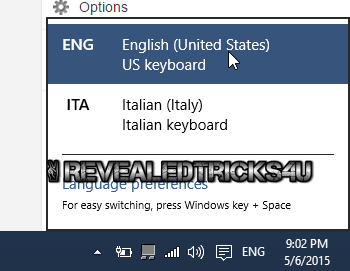 Home / featured / how-tos / Windows / How to change your keyboard input language in Windows 8,8.1,10..
How to change your keyboard input language in Windows 8,8.1,10..
As we know it is important for users who use their keyboard to type different languages.But what is the easiest way on "How to change your keyboard input language".So it's not possible to change the keyboard input language going to control panel and doing blah blah.Here below are two ways of changing the keyboard input language. Goto your Start Menu panel's right most corner and Click on the input language button like this. Now click on that and select your preferred input language from the list. That's it you have successfully changed your keyboard input language. This is the most simplest way and fastest way to change the keyboard input language for multi-language rapid typers. Just use this combination WIN+SPACE ,you will see a pop up with input languages continue pressing space will change the selection,if you got your desired language then just leave all the key pressed. That's it hope you enjoyed the trick.